Sunderland claimed their sixth home league win of the season as goals from Danny Welbeck, Darren Bent and Asamoah Gyan comfortably disposed of Blackburn. Welbeck's well-struck snap-shot found the visitors' net via Ryan Nelsen with little more than 10 minutes gone. Bent guided in a glancing header from Ahmed Elmohamady's cross soon after and Rovers rarely threatened a reply. El-Hadji Diouf blazed over from the visitors' best opening, but Gyan swept home from a swift late counter-attack. 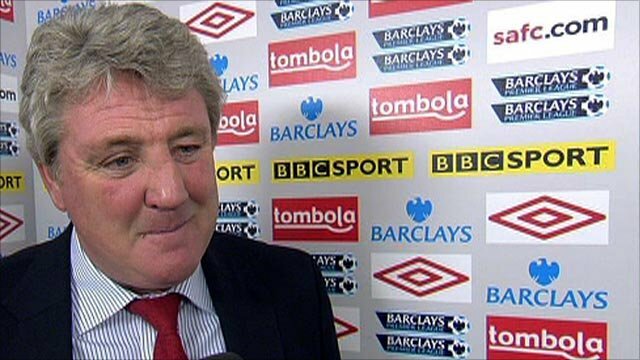 Defeat would have resulted in it being the first time Steve Bruce had suffered successive home losses while in charge at the Stadium of Light, but a pair of early goals all but eliminated that prospect. Instead Bruce, who turned 50 on New Year's Eve, will have his eyes on out-of-form Chelsea's fifth place, four points and one spot ahead of his men. The hosts had failed to find the net in defeat last time out against Blackpool despite 34 strikes on goal, but rediscovered their scoring touch with their first two attempts. David Hoilett's forthright tackle had prevented Elmohamady from getting the first effort in on Craig Gordon's goal, but, after making his way gingerly to the sidelines, he recovered to supply assists for both goals. Nelsen partially cleared the Egyptian loanee's first cross, but his header fell only as far as Welbeck and the striker returned fire with a smart half-volley that deflected off the New Zealand defender's chest and past a stranded Mark Bunn. It was Welbeck's sixth goal in eight games, but Sunderland's second came as welcome relief for Bent, who had not scored in his previous five games. It arrived eight minutes later when another swirling Elmohamady delivery invited Bent to squeeze in front of Grant Hanley and the England striker directed a glancing header past Bunn, who was enduring a miserable time on his first Premier League start. With the Blackburn defenders looking justifiably tense every time Elmohamady cocked his right foot, their attacking team-mates offered little further forward. A Biram Diouf header looped tamely over the bar before David Dunn's speculative effort was bravely blocked by David Meyler before it had time to threaten Gordon's goal. When a genuine opening did arise, El-Hadji Diouf, who spent six months on loan at Sunderland two years ago, squandered the chance to halve the deficit and quieten the jeers aimed at him by the home support. Morten Gamst Pedersen's free-kick found him unmarked at the far post and, although the ball was at an awkward height, it was no excuse for a side-foot volley that comfortably cleared the crossbar from all of five yards. Dunn came as close as the Senegal striker from considerably further out, but Sunderland remained dangerous as the half drew to a close. Welbeck had constantly harried the Rovers' backline and he clipped the bar with a cute chip that Bunn looked to have covered. Rovers boss Steve Kean used a calf injury to Grant Hanley as a chance to introduce Benjani, and a more attacking formation, at the break. With almost his first touch took the Zimbabwean neatly slipped Titus Bramble and his arrival seemed to give the visitors more purpose. Mame Diouf nodded narrowly wide before Gordon was thankful that a thumping volley from Dunn strayed into the stands. Sunderland remained more incisive however and Bent should have topped off some slick build-up play from Kieran Richardson and Steed Malbranque with a close-range finish, but contrived to screw wide. Rovers' attempts to force their way back into the game allowed the Black Cats more space to run at a defence that looked in need of the steadying influence of the injured Christopher Samba. Bent should have exploited their fragility but his snap-shot trailed wide before Jordan Henderson flicked the woodwork with a carefully-struck effort from the edge of the area. Henderson was not to be denied though and with the freedom to look up and Rovers badly exposed, helped decorate the victory with a third goal. His pass allowed Gyan to drive deep into the box and curl the ball round the retreating Brett Emerton and into Bunn's bottom corner to end his own barren run of six games without a goal. Phillip Bardsley came within inches of converting Boudewijn Zenden's low cross in injury-time but Blackburn were spared a heavier defeat on a thoroughly dispiriting outing. Sunderland manager Steve Bruce: "We have had a great start but I believe in this league this is where it starts. Teams pick up injuries and we have to push on. The big thing is can we sustain it? That is the challenge ahead can we maintain this position and clinch a top-10 finish? "I think we are in a good position now with a good young squad and the players I have in mind, to be honest, won't be available in January. I won't be adding bodies for the sake of it. But if someone becomes available then it is my job to be knocking on the chairman's door. "I would like to dedicate the win to Sam Allardyce. I know he won't like us beating his former team, but after what has happened to him over the past couple of weeks I am delighted and I will have a few glasses of wine to him tonight." 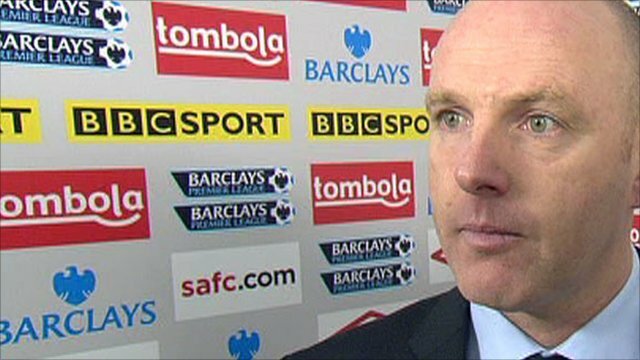 Blackburn boss Steve Kean: "We were disappointed with the amount of crosses that came in and that is something we will have to put right. We hoped Chris Samba would be back today but he is still feeling his ankle and hopefully we will have him and some of the others against Liverpool. "If El-Hadji Diouf's chances had gone in it would have been a different game. We were disappointed because we started the second half well as well, but it is a game of fine margins. "We are very confident we will not be drawn into the relegation battle. We have had a good response from the lads despite the defeat today. We have been positive, we have gone out and tried to play and we are confident that we will be looking up in the games to come." 90:00+4:13 The final whistle is blown by the referee. 90:00+2:51 The ball is delivered by Boudewijn Zenden. 88:34 Anton Ferdinand challenges El-Hadji Diouf unfairly and gives away a free kick. Shot on goal comes in from Morten Gamst Pedersen from the free kick, Jordan Henderson provided the assist for the goal. Blocked by Anton Ferdinand. 88:34 GOAL - Asamoah Gyan:Sunderland 3 - 0 Blackburn Asamoah Gyan finds the back of the net with a goal from just inside the area to the bottom right corner of the goal. Sunderland 3-0 Blackburn. 87:07 Jordan Henderson delivers the ball, save made by Mark Bunn. 86:03 Marcos Angeleri sends in a cross. Correction - 84:08 Unfair challenge on David Meyler by Mame Diouf results in a free kick. Free kick taken by Phillip Bardsley. Correction - 84:08 Substitution Herold Goulon on for David Dunn. Correction - 84:08 Substitution Ahmed Elmohamady goes off and Marcos Angeleri comes on. 84:08 Mame Diouf challenges David Meyler unfairly and gives away a free kick. Phillip Bardsley takes the direct free kick. 84:08 Substitution Herold Goulon comes on in place of David Dunn. 84:08 Substitution (Sunderland) makes a substitution, with Marcos Angeleri coming on for Ahmed Elmohamady. 83:13 Unfair challenge on David Meyler by Josh Morris results in a free kick. Free kick taken by Phillip Bardsley. 82:17 Jordan Henderson takes a shot. Save by Mark Bunn. 80:51 Free kick awarded for a foul by Titus Bramble on Morten Gamst Pedersen. Direct free kick taken by Morten Gamst Pedersen. 80:51 Substitution Asamoah Gyan joins the action as a substitute, replacing Darren Bent. 78:38 Booking Anton Ferdinand goes into the referee's book. 77:20 Jordan Henderson takes a shot. 77:20 Substitution (Blackburn) makes a substitution, with Josh Morris coming on for David Hoilett. 75:39 Darren Bent takes a shot. Ryan Nelsen gets a block in. 74:24 Effort from deep inside the area by Darren Bent misses to the right of the target. 73:08 Kieran Richardson gives away a free kick for an unfair challenge on El-Hadji Diouf. The free kick is delivered left-footed by Morten Gamst Pedersen from right wing. 70:18 Free kick awarded for an unfair challenge on Boudewijn Zenden by Brett Emerton. Free kick taken by Kieran Richardson. 68:49 Booking Mame Diouf goes into the referee's book. 68:33 Substitution Boudewijn Zenden on for Danny Welbeck. 67:13 The assistant referee signals for offside against Benjani Mwaruwari. Craig Gordon takes the direct free kick. 66:50 David Hoilett takes a shot. Blocked by Anton Ferdinand. 64:56 The referee blows for offside. Mark Bunn restarts play with the free kick. 64:33 Steed Malbranque delivers the ball, Shot from deep inside the area by Darren Bent clears the bar. 62:56 David Hoilett has an effort at goal from just inside the box that misses to the left of the goal. 62:16 Mame Diouf takes a shot. Blocked by Titus Bramble. 61:37 A cross is delivered by Kieran Richardson, Close range shot by Darren Bent goes wide of the left-hand post. 58:17 El-Hadji Diouf gives away a free kick for an unfair challenge on Kieran Richardson. Craig Gordon restarts play with the free kick. 57:46 David Meyler challenges Morten Gamst Pedersen unfairly and gives away a free kick. Direct free kick taken by Mark Bunn. 55:12 David Meyler challenges Gael Givet unfairly and gives away a free kick. Mark Bunn takes the direct free kick. 54:29 David Dunn has an effort at goal from just outside the box which goes wide of the right-hand upright. 53:37 El-Hadji Diouf delivers the ball, Header by Mame Diouf from deep inside the penalty area misses to the left of the goal. 53:05 Free kick awarded for an unfair challenge on Gael Givet by Darren Bent. Free kick taken by Mark Bunn. 51:20 The ball is swung over by Steed Malbranque, Gael Givet makes a clearance. 50:58 Free kick awarded for a foul by David Dunn on Danny Welbeck. Kieran Richardson takes the direct free kick. 50:58 Booking David Dunn goes into the book. 46:44 Outswinging corner taken left-footed by Morten Gamst Pedersen from the left by-line. 45:01 Substitution Benjani Mwaruwari on for Grant Hanley. 45:00+4:06 The players leave the pitch at half time. 45:00+2:25 Kieran Richardson gives away a free kick for an unfair challenge on El-Hadji Diouf. Mark Bunn takes the direct free kick. 45:00+1:44 The ball is crossed by Kieran Richardson, Gael Givet makes a clearance. 45:00+1:07 Martin Olsson gives away a free kick for an unfair challenge on Ahmed Elmohamady. Direct free kick taken by Phillip Bardsley. 45:00+0:06 Free kick awarded for an unfair challenge on Brett Emerton by Steed Malbranque. Morten Gamst Pedersen crosses the ball in from the free kick. 44:19 Jordan Henderson takes a shot. Blocked by Ryan Nelsen. Jordan Henderson takes the inswinging corner, Mark Bunn makes a comfortable save. 43:07 David Dunn has an effort at goal from outside the area which misses left. 42:28 Corner taken by Morten Gamst Pedersen. 41:00 Anton Ferdinand concedes a free kick for a foul on David Hoilett. Brett Emerton takes the free kick. 40:36 The ball is sent over by Ahmed Elmohamady. 36:16 Danny Welbeck takes a shot. 36:05 Phillip Bardsley sends in a cross, Ryan Nelsen makes a clearance. 35:16 Steed Malbranque challenges Morten Gamst Pedersen unfairly and gives away a free kick. Direct free kick taken by Morten Gamst Pedersen. 33:14 David Meyler challenges David Dunn unfairly and gives away a free kick. A cross is delivered by Morten Gamst Pedersen, Close range strike by El-Hadji Diouf goes over the bar. 32:49 Darren Bent is caught offside. Free kick taken by Mark Bunn. 31:19 Brett Emerton takes a shot from inside the box clearing the bar. 30:04 The ball is crossed by Steed Malbranque, Darren Bent produces a header from inside the area that goes over the bar. 26:58 The ball is crossed by Ahmed Elmohamady, clearance by Gael Givet. Outswinging corner taken by Jordan Henderson from the right by-line, Martin Olsson makes a clearance. 22:56 Centre by Steed Malbranque. 21:25 Foul by Brett Emerton on Steed Malbranque, free kick awarded. Free kick crossed right-footed by Jordan Henderson, save made by Mark Bunn. 19:40 David Dunn fouled by David Meyler, the ref awards a free kick. The ball is sent over by Morten Gamst Pedersen, Mame Diouf produces a header from inside the area that goes over the crossbar. 18:20 The assist for the goal came from Ahmed Elmohamady. 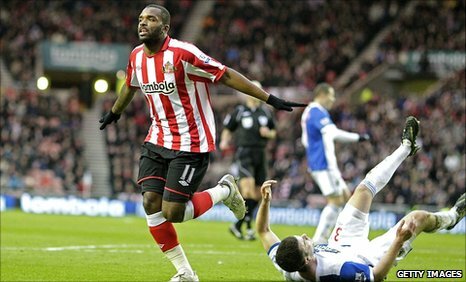 18:20 GOAL - Darren Bent:Sunderland 2 - 0 Blackburn Darren Bent grabs a headed goal from inside the penalty area. Sunderland 2-0 Blackburn. 17:16 El-Hadji Diouf sends in a cross, clearance by Anton Ferdinand. 16:54 Martin Olsson crosses the ball. 15:29 David Dunn takes a shot. David Meyler gets a block in. 14:13 The ball is delivered by Jordan Henderson. 12:14 Outswinging corner taken by Jordan Henderson, clearance made by Gael Givet. 10:03 GOAL - Danny Welbeck:Sunderland 1 - 0 Blackburn A goal is scored by Danny Welbeck from inside the area to the bottom left corner of the goal. Sunderland 1-0 Blackburn. 7:41 Free kick awarded for a foul by El-Hadji Diouf on Titus Bramble. Jordan Henderson restarts play with the free kick. 6:42 El-Hadji Diouf challenges Anton Ferdinand unfairly and gives away a free kick. Kieran Richardson restarts play with the free kick. Correction - 4:17 Ahmed Elmohamady takes a shot. David Hoilett gets a block in. 4:17 Ahmed Elmohamady takes a shot. Grant Hanley gets a block in. 3:48 Phillip Bardsley sends in a cross. 1:40 Ahmed Elmohamady challenges Martin Olsson unfairly and gives away a free kick. Mark Bunn takes the direct free kick.